There’s no reason to spend money on outsourcing if your agency doesn’t need or isn’t ready for it. Nor is there any reason to manually manage every client project, every step of the way. It’s these kinds of inefficiencies that lead to low-profit margins and less than ideal outcomes. Economically speaking and productivity-wise, doesn’t it make more sense to optimize and automate as much of your workflow as possible? Today, I want to show you a smarter way to run your WordPress agency. 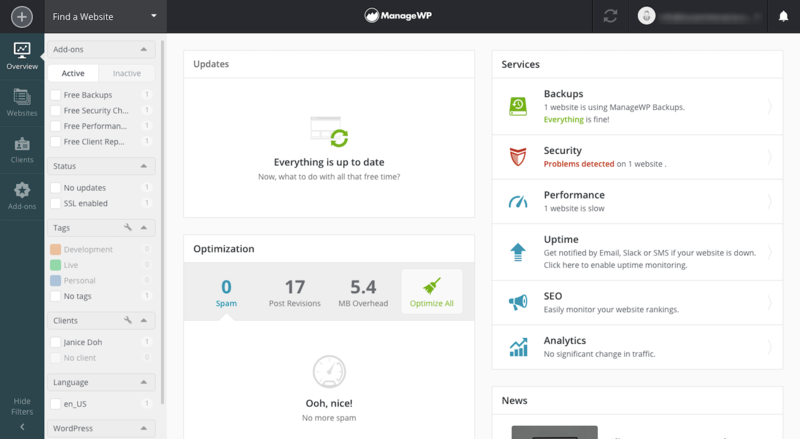 ManageWP might seem like the typical multi-site management tool for WordPress. But, I assure you, it’s chock full of powerful features that enable you to scale your efforts in no time at all. 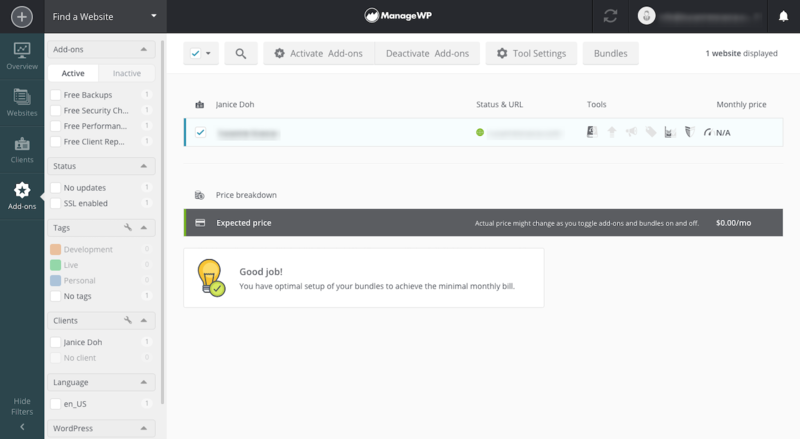 Let’s take a practical look at the features of ManageWP and how those translate into better WordPress agency management practices. 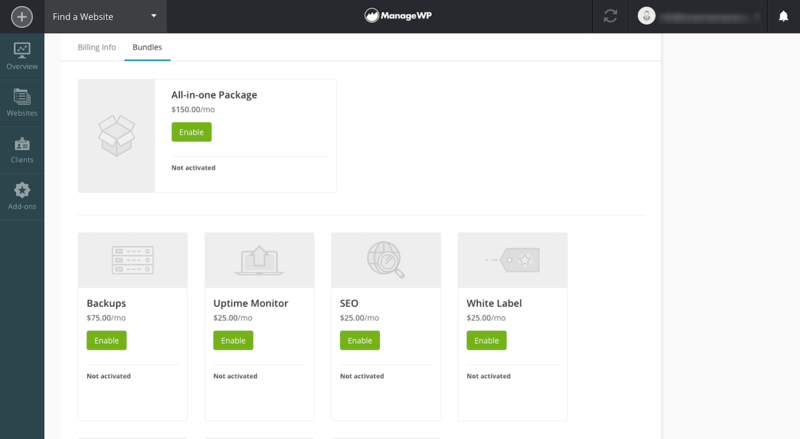 The free version of ManageWP is perfect for the freelance WordPress developer or brand new agency wanting to develop and refine their processes. As your client list grows, and as you build more sources of recurring revenue, ManageWP scales with you. 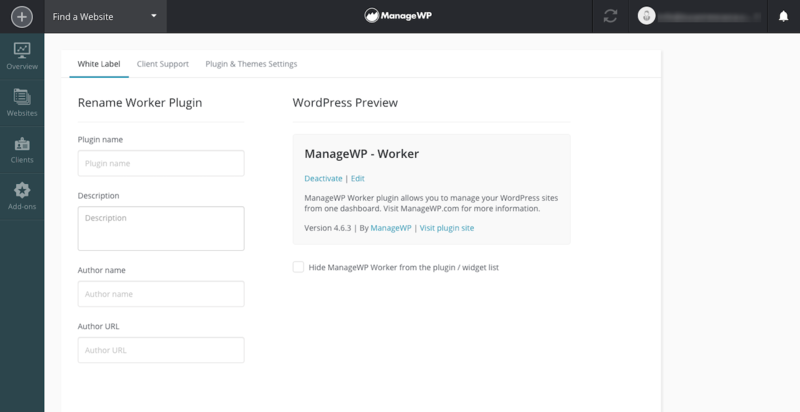 You’ve already automated much of your WordPress management and maintenance workflow for free. Premium features take even more of those tasks off of your hands and open up new opportunities to make money (like SEO monitoring). The flat fee charged for the bundle will be substantially covered (and more) by the premium maintenance plans you sell to your clients if you price them right. You can manage up to 100 websites with this, which means your costs will hold steady even as you bring in more money. 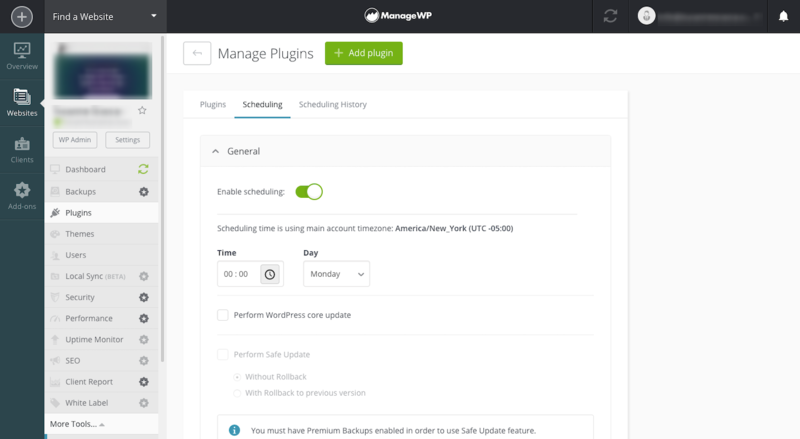 Or you can tackle individual sites and enter their ManageWP dashboard, WordPress dashboard, a history of their backups, or configure individual settings for the site. WordPress agencies succeed because they find ways to do more with less. And the centralization of client websites is a good place to start. Smart agencies spend their time on tasks that require the human touch. Developing wireframes. Troubleshooting the white screen of death. Conducting monthly client calls. 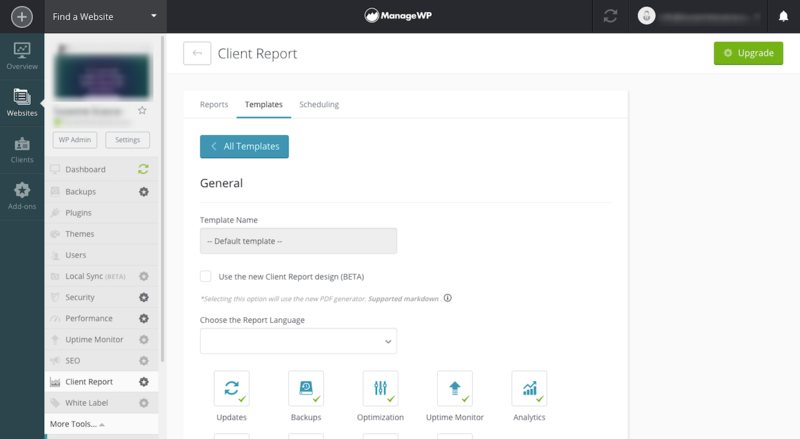 Rather than get bogged down in managing updates and security scans on each client website, use ManageWP to optimize, automate, and schedule tasks that don’t require your input. That way, you have more time to work on the tasks that need your attention. That’s not the only way ManageWP helps agencies save time either. There are a number of templates available in this tool. The Template Builder is a particularly handy tool for those who build WordPress websites. If you tend to use the same plugins and themes over and over again, why not save time hunting them down and installing them? 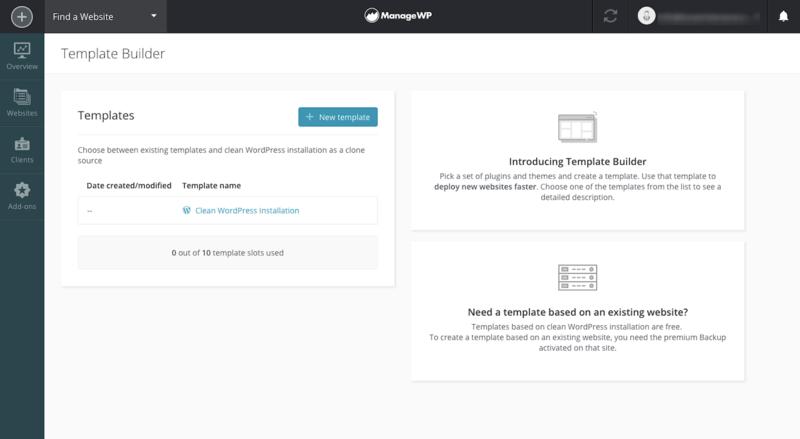 With this, you can build your WordPress “template” and then clone as needed. Another way to save yourself time is by developing a client report template. This way, you can build the standard structure of your weekly or monthly maintenance report once. Then, replicate it as you add new clients to the mix. You can even configure an automated schedule for all client reports to go out at the same time. Whether you’re a one-man show or have employees that work for you, your clients want to some assurance that their WordPress website is in good hands at all times. To remove any concerns clients might have concerning this, ManageWP has you covered. You may also want to activate a Support form. 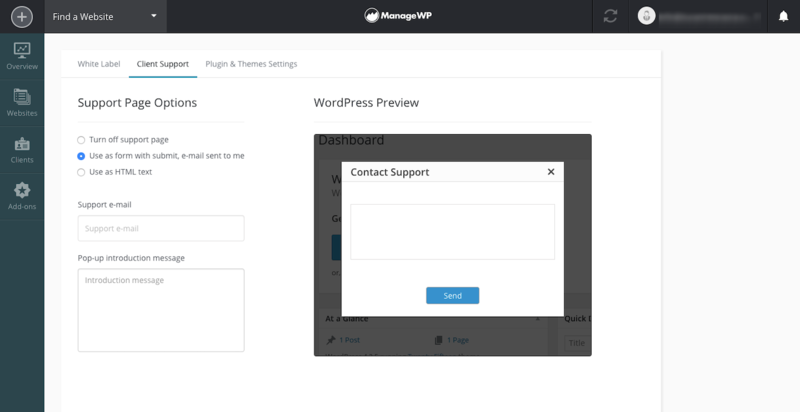 This allows clients to send support requests to you directly from their WordPress installation. Another thing ManageWP enables you to do–which I think gives agencies and solo developers a more professional polish–is quick responsiveness. For instance, when clients reach out for support, they don’t want to wait days to hear back. Since ManageWP keeps these requests from getting lost in your email inbox or voicemail, you can rest assured you’ll never miss them. The same goes for events that take place and that it’s your responsibility to respond to in real time. A website goes down. A new security vulnerability is detected. An update fails. Choose which of these events need your immediate attention and schedule instant notifications to be sent to you. I’m not the first person to suggest that ManageWP will take your agency to the next level or that it’s an essential tool in your mission to building a recurring revenue stream. Nor will I be the last. This is a solid tool that empowers you to work less but do more. 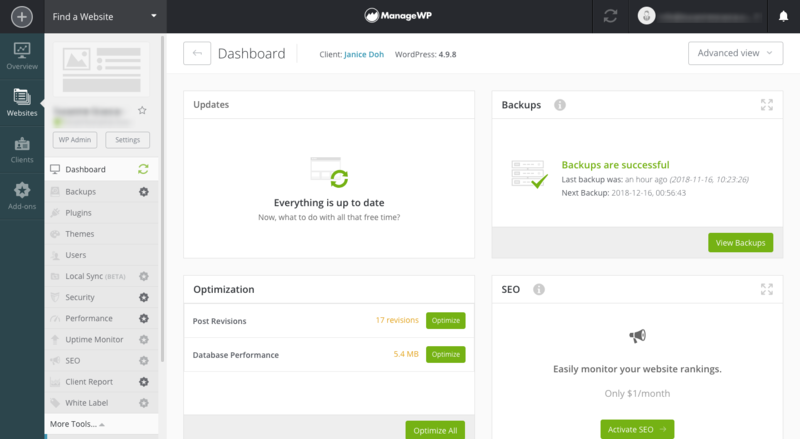 If you’re curious about what ManageWP can do to help you run your agency better, give it a try. It’s free to get started!